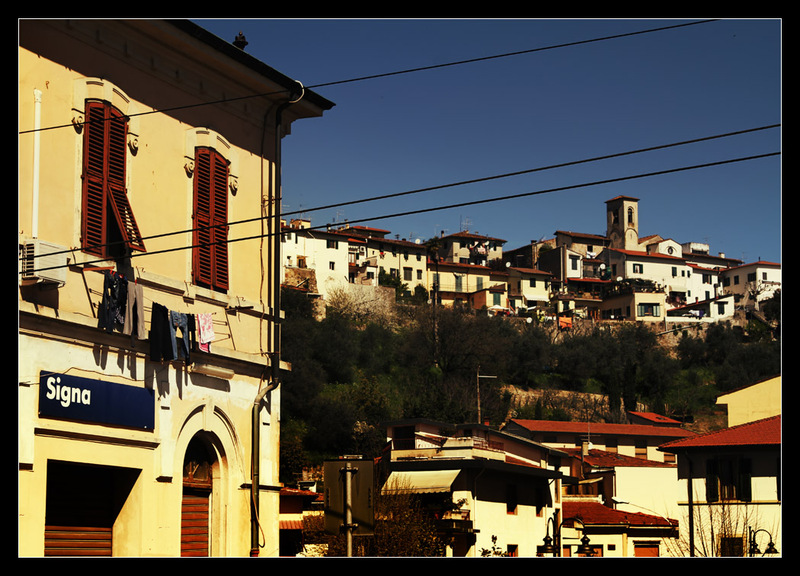 We have arrived at my base for this week, Signa, only two stops from the Florentine urban area. 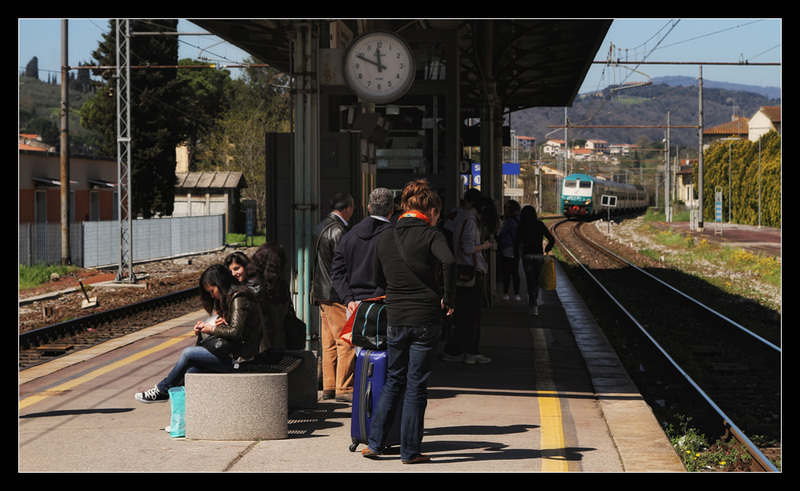 I had looked for hotels around Florence, the eventually chosen was cheap for the region and only 10 minutes on foot away from Signa station. 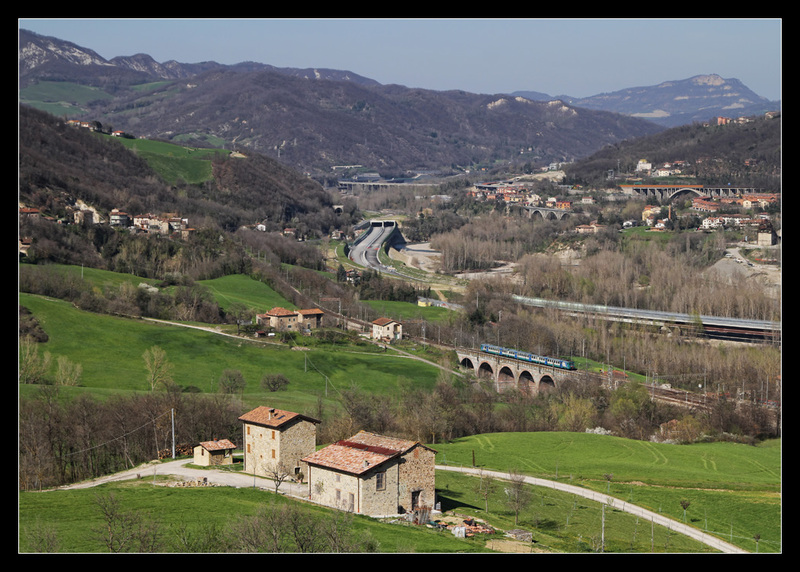 This town situated at the mouth of narrow Arno river valley offered a special feature: namely a newly built tunnel line avoiding the slow section winding through the valley, resulting in an additional station, Lastra a Signa. It was located a little further from the hotel but still conveniently reachable. 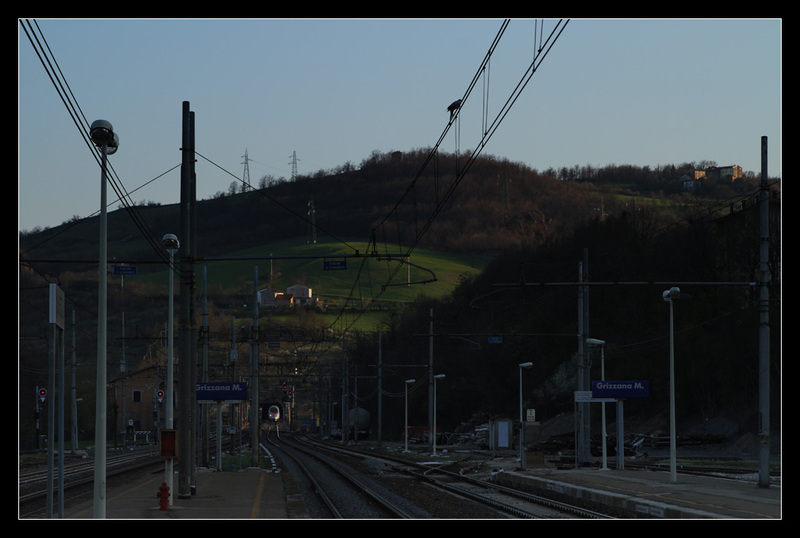 That way I had unrestricted access to all of Tuscany as almost every train stopped either here or there. 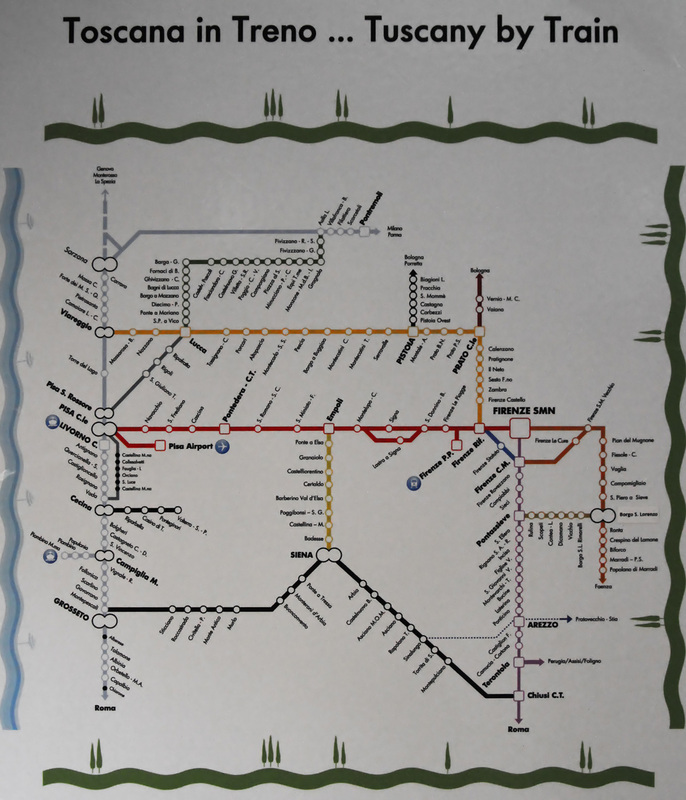 In each regional train coach you could find this overview map of railway lines in Tuscany (the one parallel line south of Livorno is indicating a bus service, if anyone is confused...). 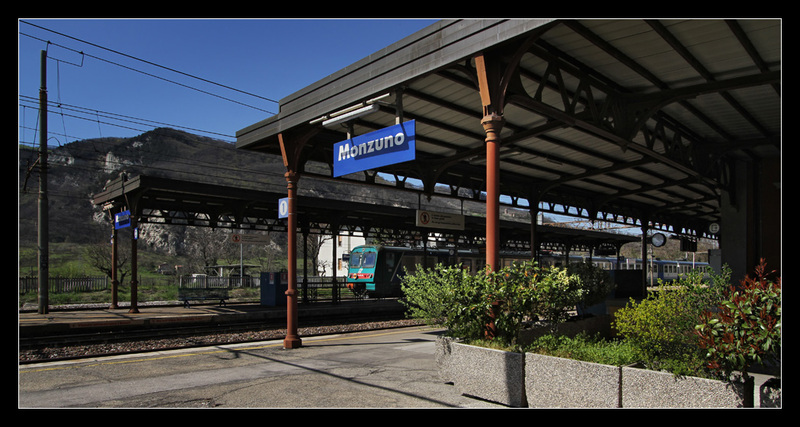 You can spot the two alternative routes at Signa well, really only splitting up for the length of Arno valley and merging again before reaching the next stop, Montelupo-Capraia. 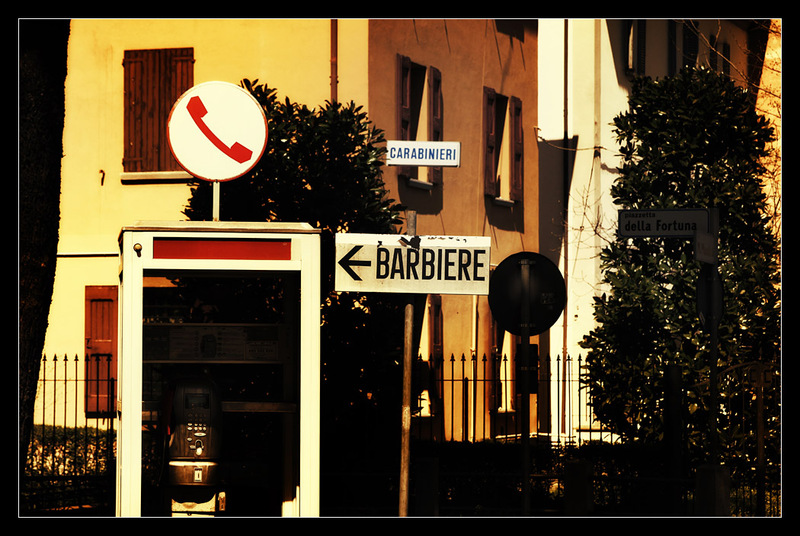 I also noticed that they forgot labelling Borgo San Lorenzo, here it had been amended, about everywhere else it was missing. 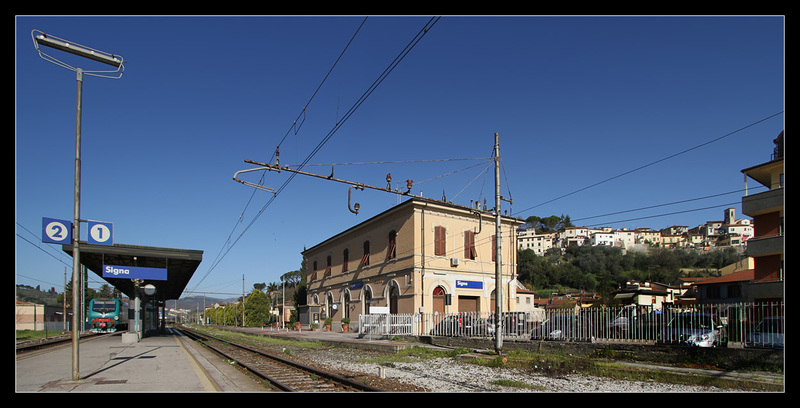 Due to a large gap between trains on Sunday mornings I left Florence quite early and arrived at Signa shortly after nine. 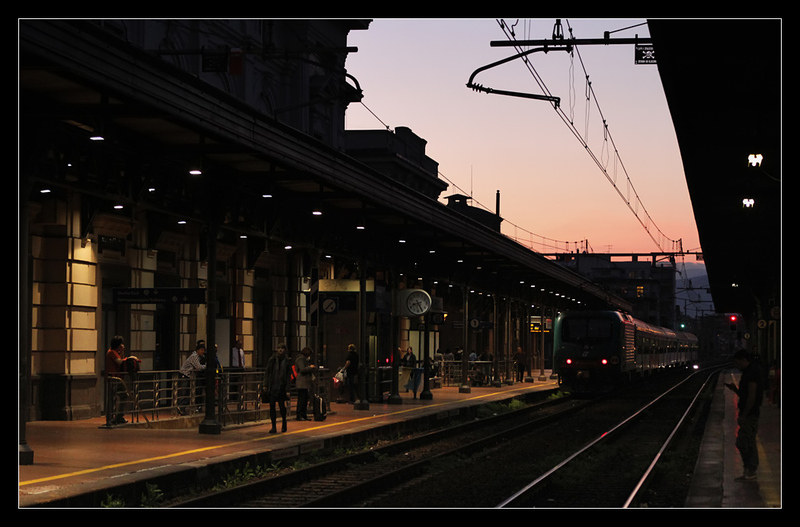 I pulled my bag across the nice station square and further along high street Via Roma, which I would get to know well over the following week. At first the pavement was quite narrow with a lot of traffic on the roadway, but soon I entered a reduced-traffic area where vehicles into one direction had been diverted out of the town centre. 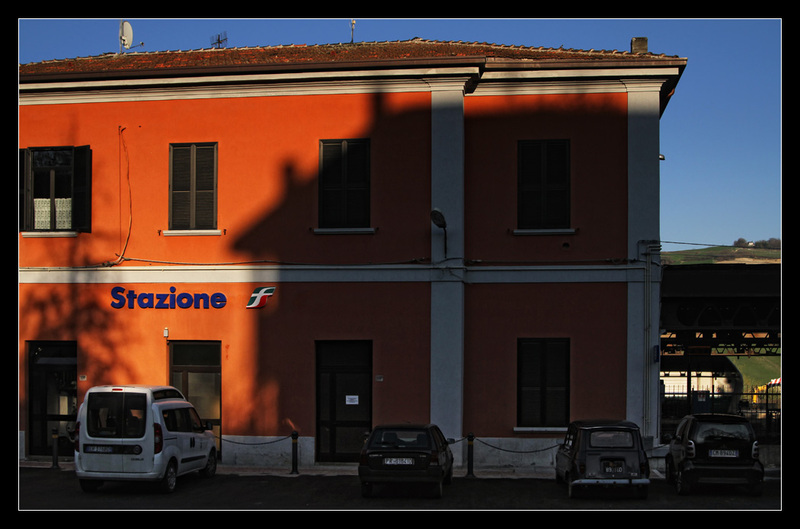 Local supply was good, 5 pizzerias, one grocery store, one winestore and even a laundrette on the short walk to the hotel, a large supermarket right behind it. I could check into my room immediately, offered amenities were adequate for the money, only a shower tray was missing - I hate that, I would exchange any LCD-TV anytime for a proper shower! The bathroom was at least constructed well enough that showering did not lead to a complete flooding every time. In China I had a bath where the water went everywhere, just not into the drain... Other than that you were able to get comfortable and so I relaxed a bit as the train for my Sunday excursion would not leave until shortly before noon. I had arrived at the station with enough spare time to buy another batch of tickets. At least until Wednesday when I had planned half a day's rest providing opportunity for further purchases. A man of Asian descent was looking on with joy how I used the touch screen, when I showed him that another machine was around the corner, he refused - obviously he just liked to watch me. As I started entering my PIN for the first time, he moved on. I proceeded successfully with ticket purchases - in the meantime someone had hung up laundry at the station building, in the background old Signa town centre on a hill. 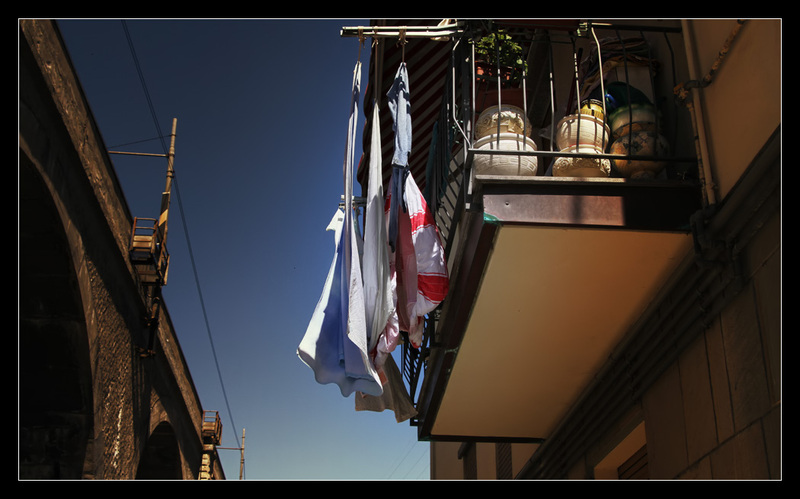 Balconies and hanging laundry are very picturesque in Italy - you could spend a whole trip taking pictures of just that, I call this series in a series "balcony photography". 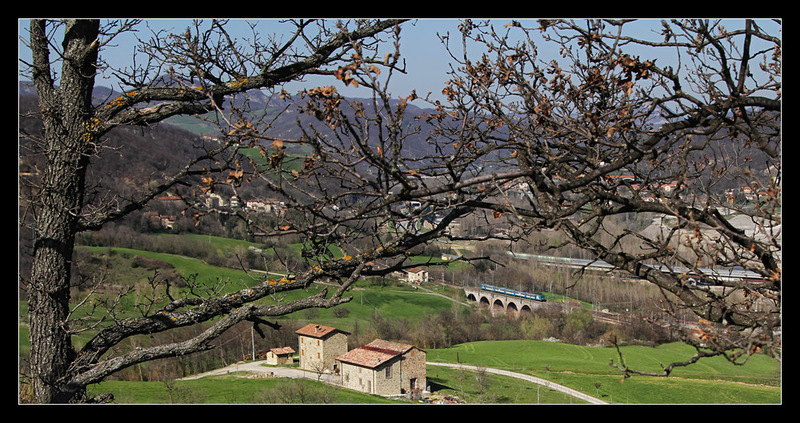 Arrived at Monzuno-Vado we have left Tuscany region and rejoined Emilia-Romagna, close to Bologna. 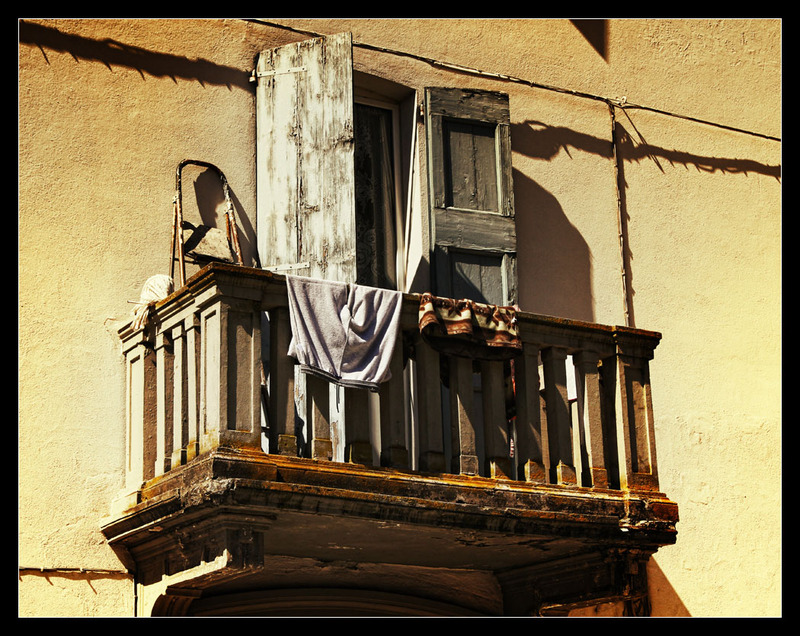 We find ourselves along the old Direttissima Florence - Bologna. 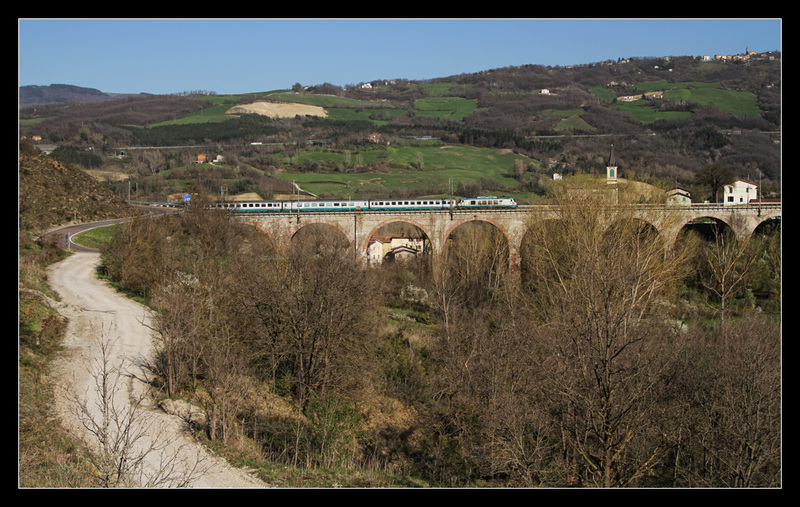 The oldest railway connection across the Apennine Mountains was the 1864 opened so called Porrettana, leading via Pistoia to Bologna (see map). 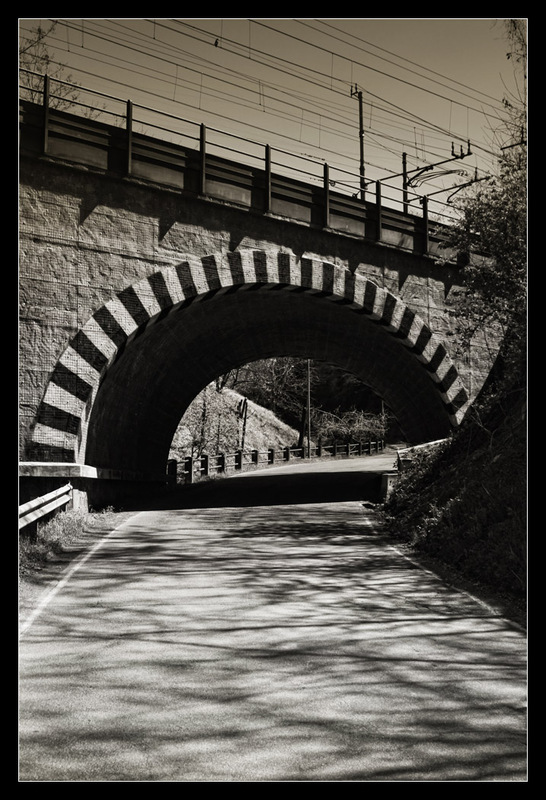 However, this single track, winding line soon was not sufficient anymore for traffic demand of the day, so this mammoth task was planned in the beginning of the 20th century and carried out between 1913 and 1934. 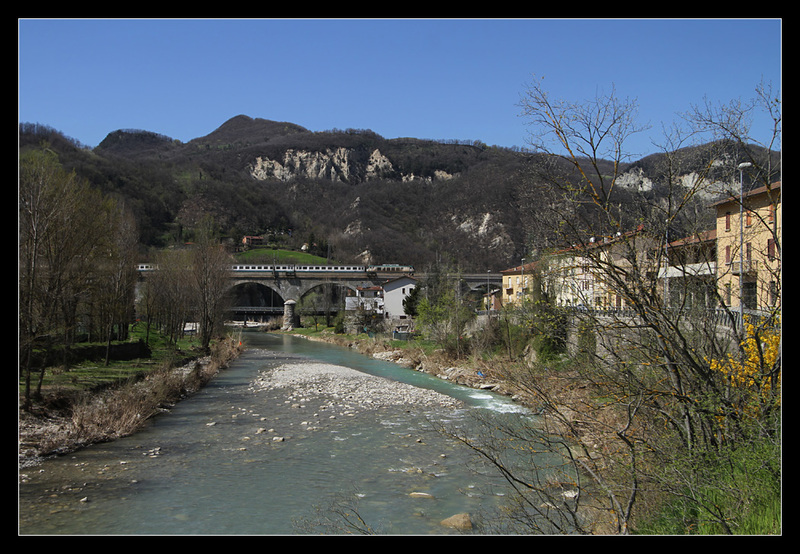 On my ride I already had traversed 18.5 km long "Grande Galleria dell'Appennino", the Apennine base tunnel. 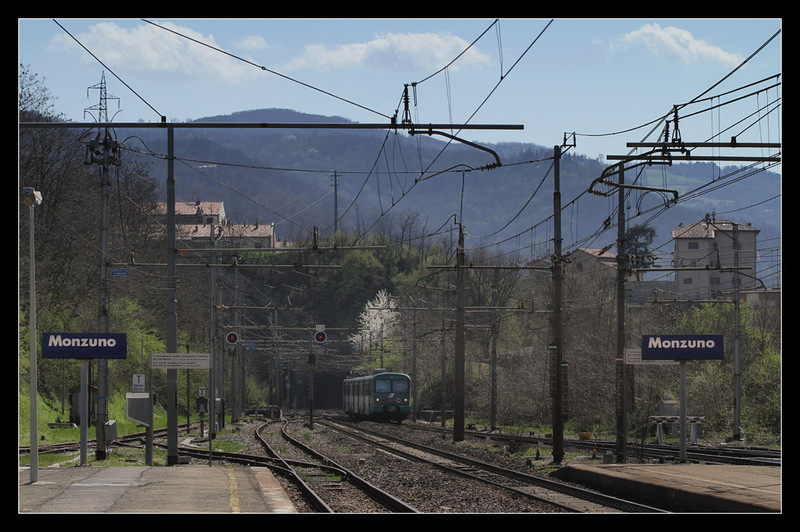 Since 2009 this railway had lost its importance due to the opening of the new high speed line, but was still used by InterCities, night trains, locals and freights (latter rather unlikely on Sundays). 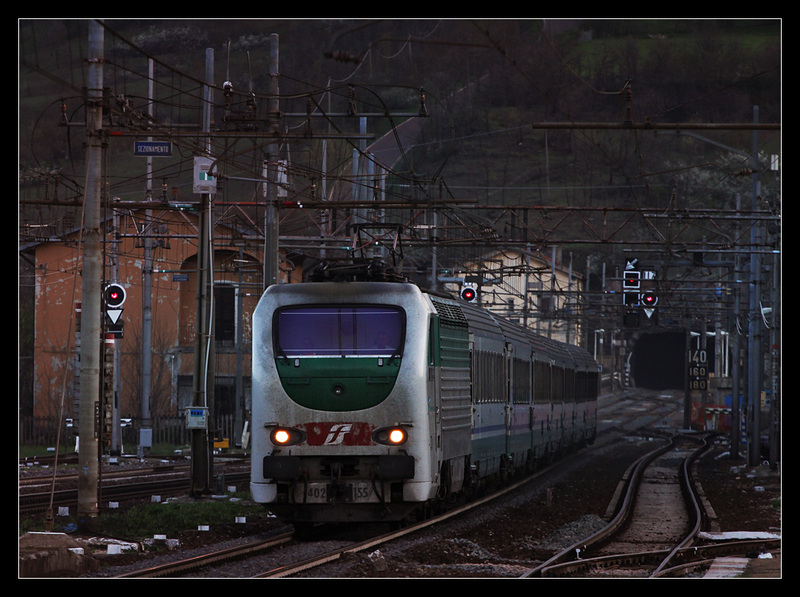 ...a few seconds later this lovely rake of IC 587 Milano Centrale - Roma Termini hauled by classic E444R 011 turned up! 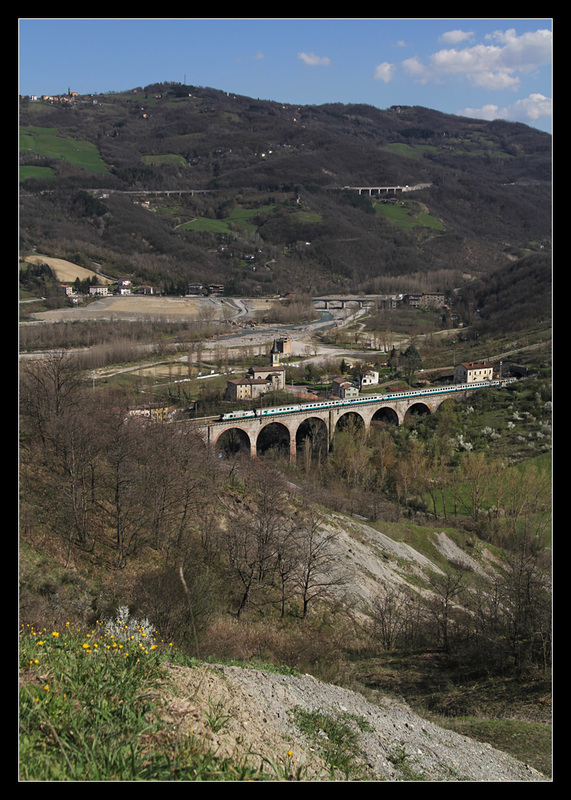 Overview of Vado village with viaduct and Setta river. 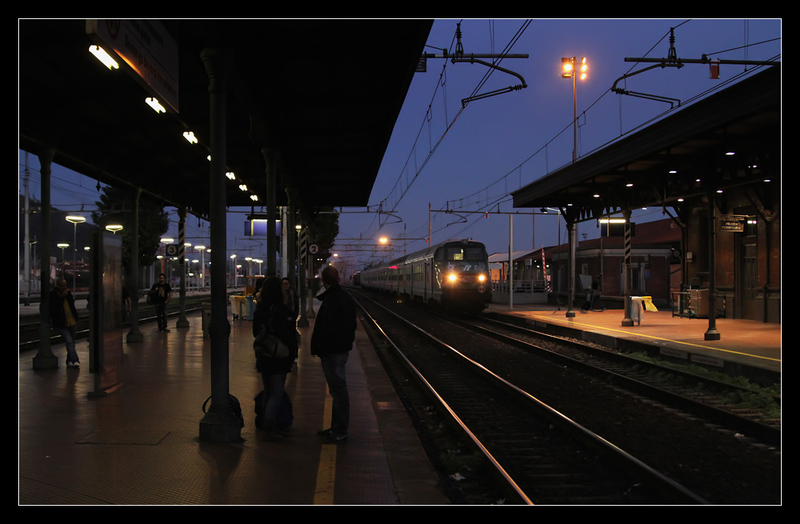 Soon I expected R 6543 Bologna Centrale - Prato Centrale, it took some time and approached with 10 minutes delay. I was happy about EMU ALe 582 085, the push-pull train that had brought me here never showed again. Change of positions right away. 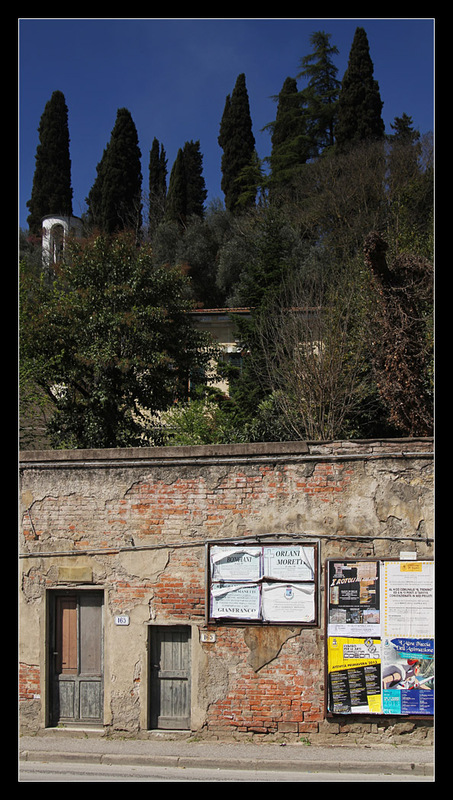 In the Apennines I noticed many landslides, like this one between houses at the edge of the villlage. Mountain spring, of course not as progressed as in the lower parts of Tuscany. 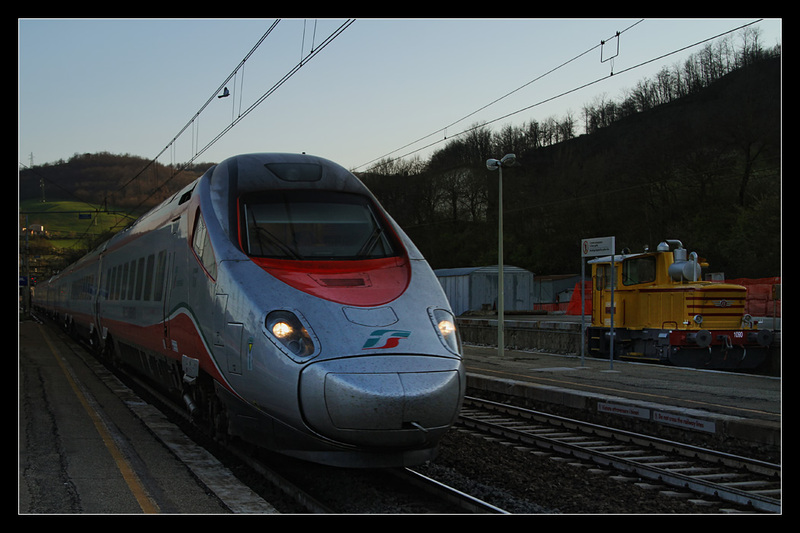 Next on schedule was InterCity 588 Napoli Centrale - Trieste Centrale pulled by a class E402A. Some plants already blossomed nicely. Subsequently I conveniently had time in the village, only one bar was opened, about all the inhabitants had gathered there. Many delicacies were on offer, I only stocked up on drinks and skipped the home made ice cream that time. I slowly wandered back to the station, through this zebra-striped subway. At the station I took a sunbath and ate lunch. 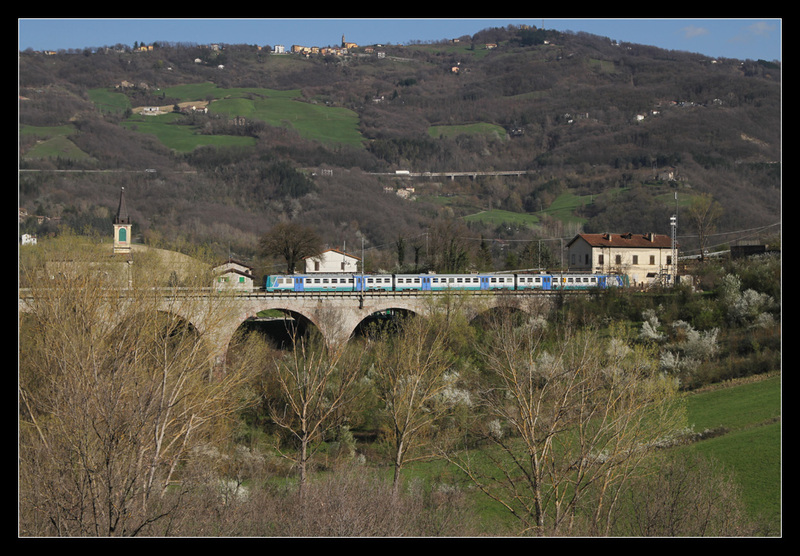 At 15:19 ALe 582 085 returned as R 6546 back to Bologna out of the tunnel beneath the village. 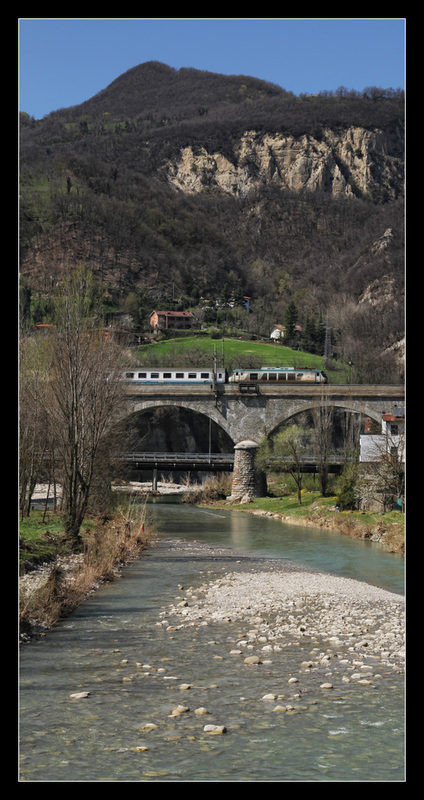 ALe 642 032 had taken me one stop towards Firenze, Grizzana Morandi, on the short ride I even was checked by the conductor who carefully exmined the ticket, obviously only few people use the train between mountain villages. Overall tickets were only rarely checked on this journey. Out of the station I first followed the railway along the hillside, then took the first road uphill suspecting a panoramic spot at the top. I had seen photos from several angles, but none from up there. 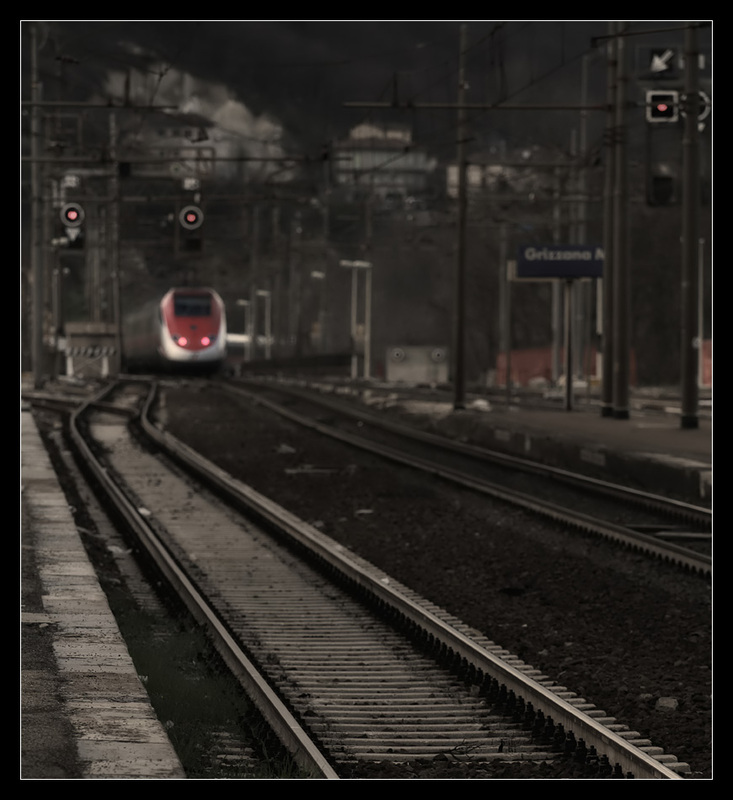 Only few minutes were left until the next InterCity and the road featured a long serpentine back towards the station. I still arrived in time and climbed the last metres past another landslide. 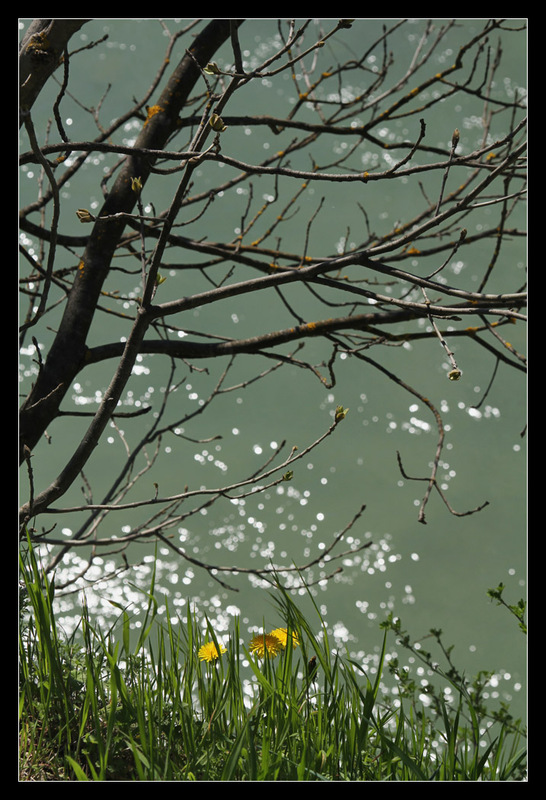 Views were possible into every direction - I had not thought I would climb an Apennines hilltop that day, otherwise I would have worn my trecking shoes, the second pair of trainers hurt my feet a little after such a long fast walk. Awaiting the express I sat down in the grass, yet InterCity 590 Salerno - Milan was delayed so there would have been no hurry. 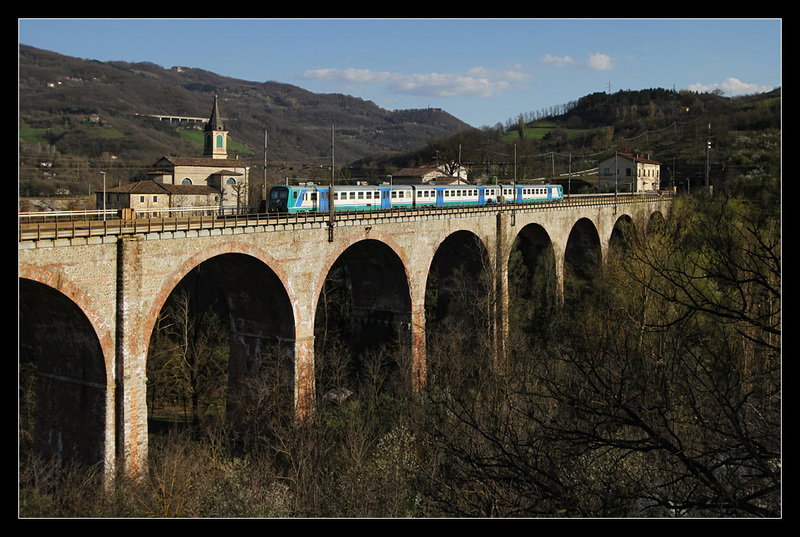 Finally another class E402A showed up on the viaduct next to Plandisetta village, part of Grizzana comunity spread across two valleys. If you examine the picture closely, you may discover an old white Fiat 500 on the road. Valley view next to the landslide, I had walked up on the road to the left. The other direction also featured panoramic views. 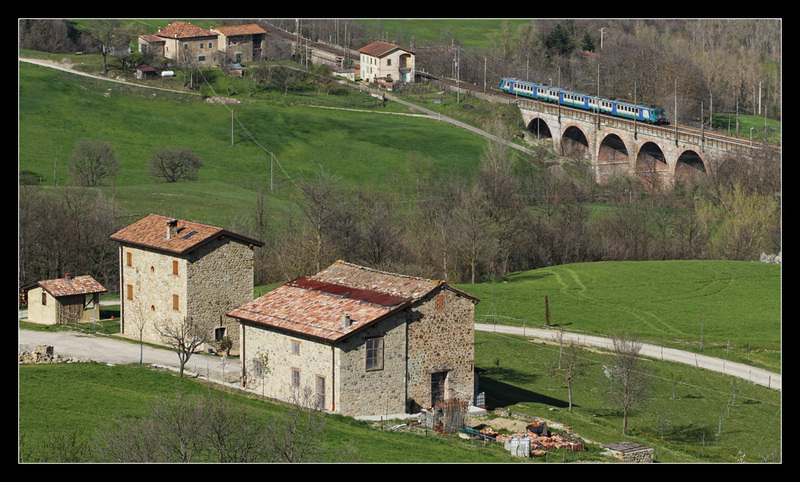 R 6547 Bologna - Prato in idyllic mountain farm surroundings? 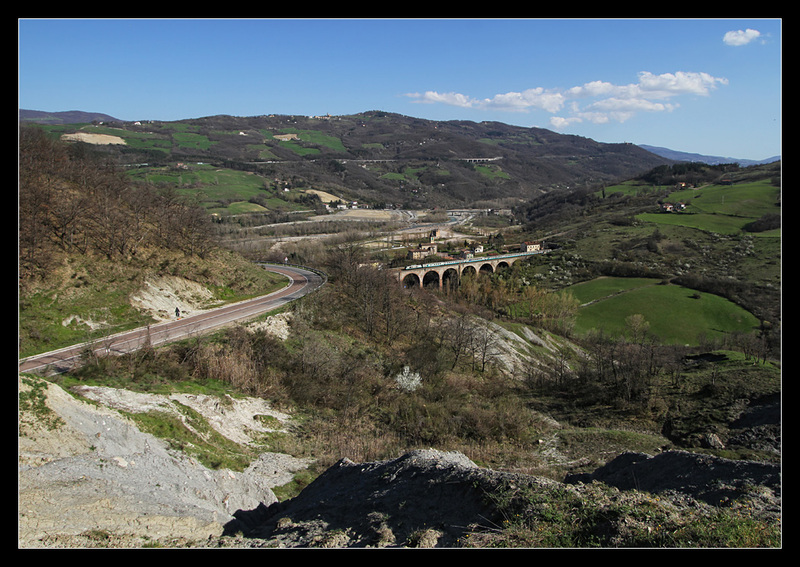 Sadly not anymore... the old motorway Autostrada del Sole was already following the valley on the hill, now the new alternative route Variante di Varico was being constructed right on the bottom. 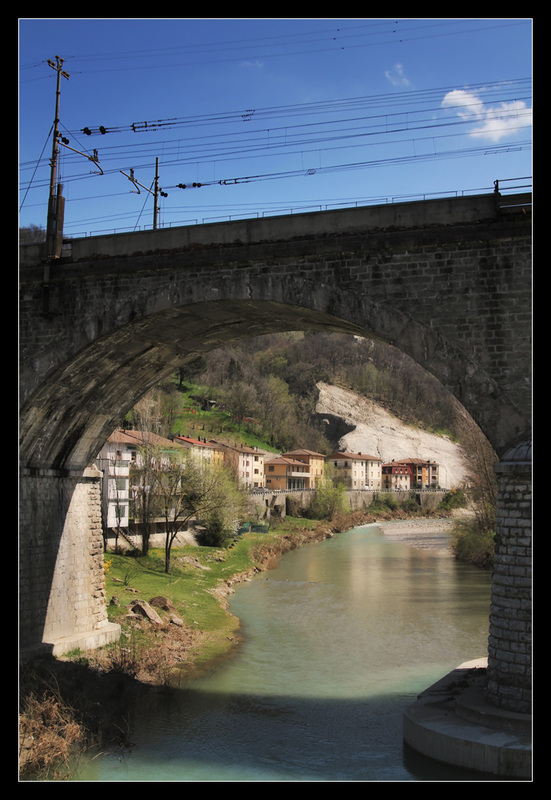 ... or use the chance for this fascinating comparison of 20th century arched bridges. I wandered downhill and scouted possibilities. Originally I had planned to cross to the other side, but since no direct path existed, I settled for a side view - you could hide the construction site that way, too. 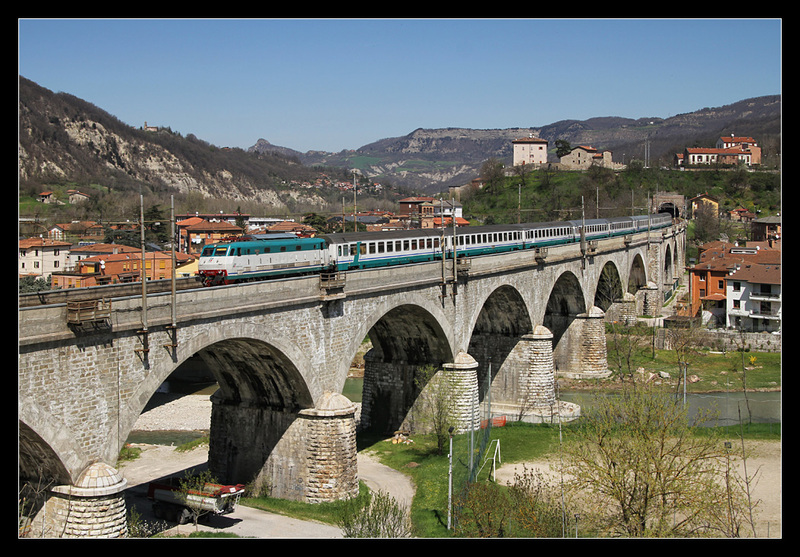 R 11636 Prato - Bologna passed punctually. Into the other direction IC 595 Trieste - Naples followed. I decided to leave at 18:46 and moved back towards the station. 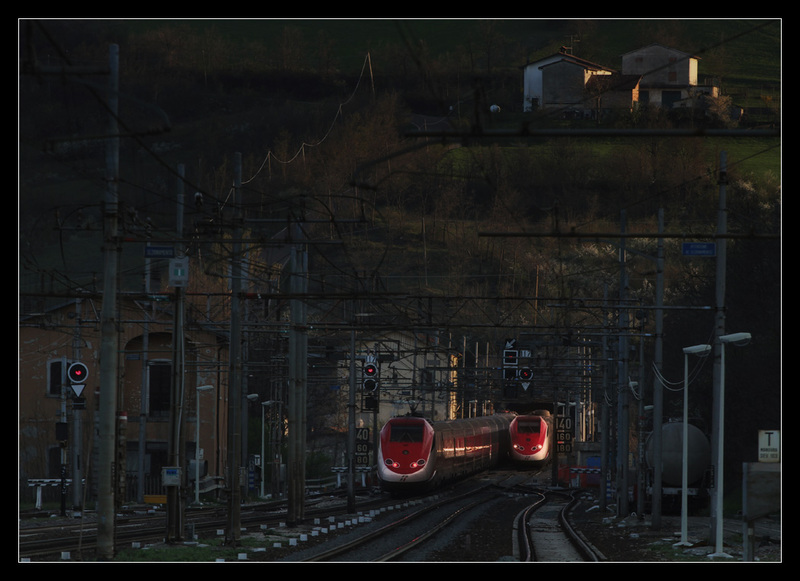 I still had to wait for R 6548 Prato - Bologna as well as the oncoming IC 597 Milan - Naples. 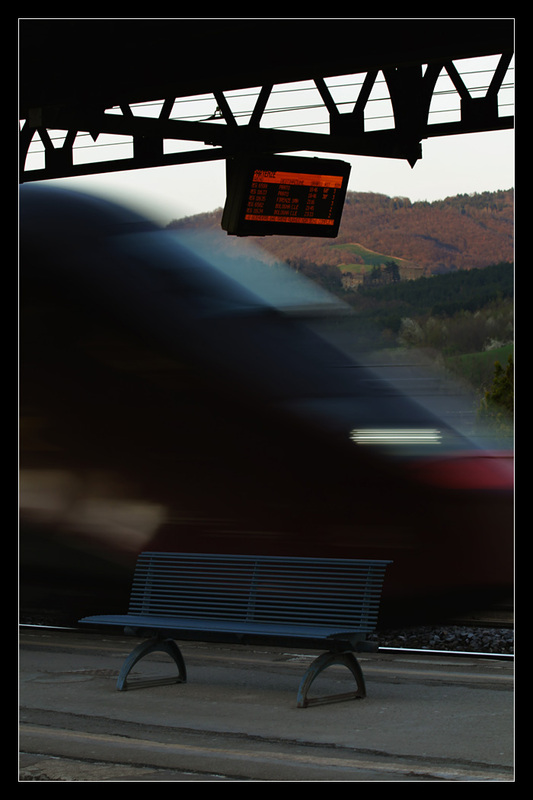 The spot is situated at the roadside, you only could sit down more or less uncomfortably on the crash barrier. Which were answered quickly: just as I reached the station a class E402B hauling the InterCity followed six minutes behind the Eurostar. What had happened? Well, my local train scheduled for 18:46 suddenly was shown on the displays with 60 minutes delay! 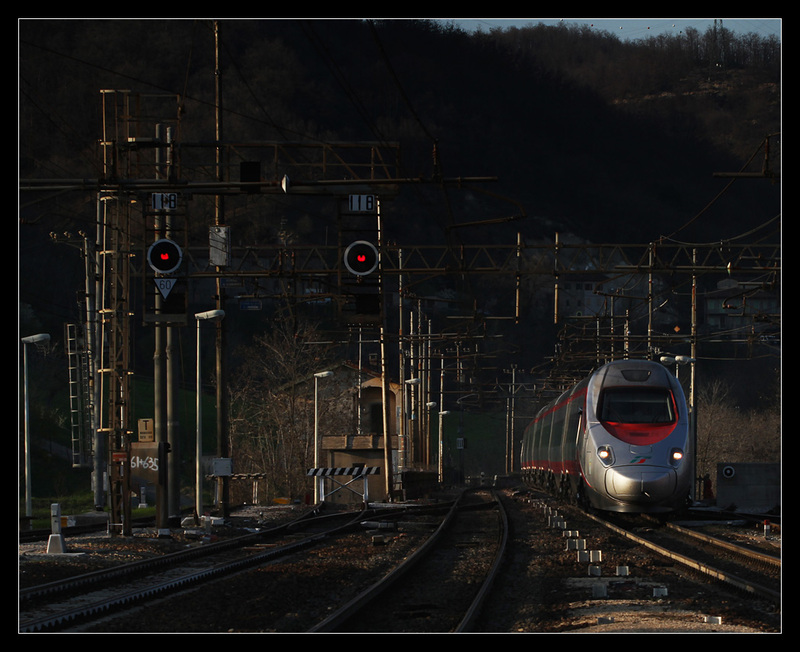 Meanwhile the line became very busy, obviously the new high speed line was disrupted and all Eurostars were rerouted via the old Direttissima! 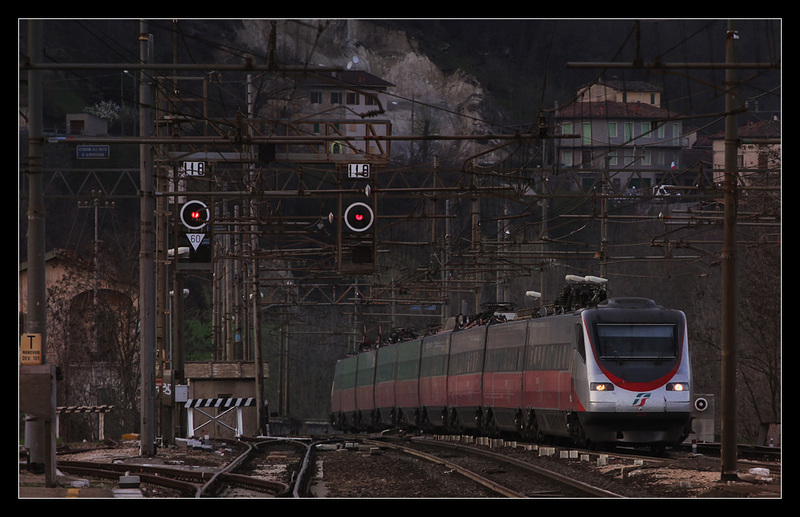 Ten minutes later a class ETR 500 "Frecciarossa" followed. 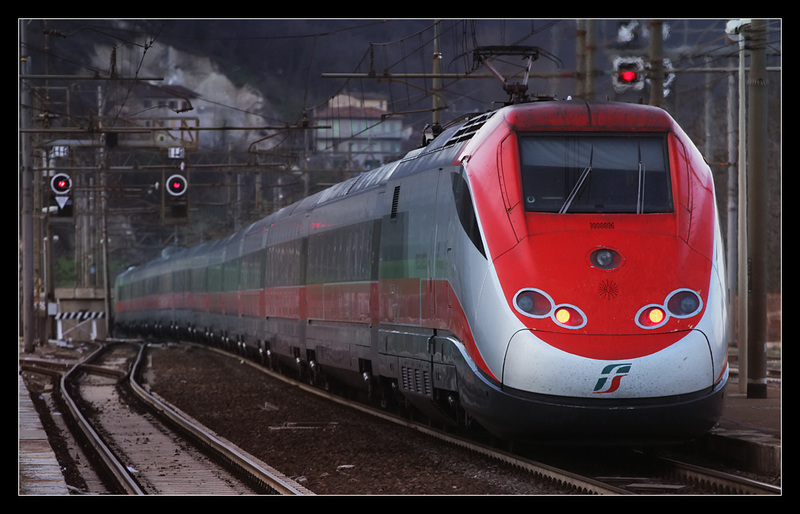 Eurostar Italia trains are categorized on this line into "Frecciarossa" (the fastest trains on the Salerno - Naples - Rome - Florence - Bologna - Milan - Turin relation) and "Frecciargento" (Rome - Venice and other destinations in the north east as well as south). Comparison with an old, but well maintained construction train diesel shunter. 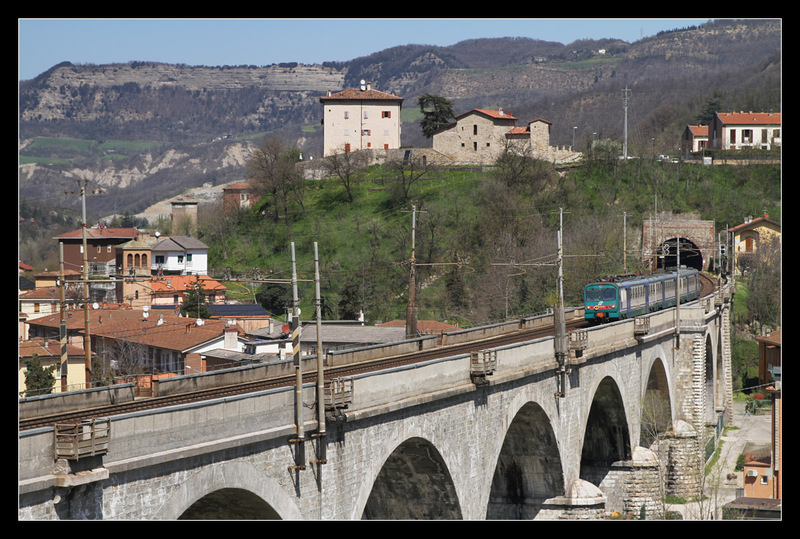 Meeting of two class ETR 500 on the bridge. 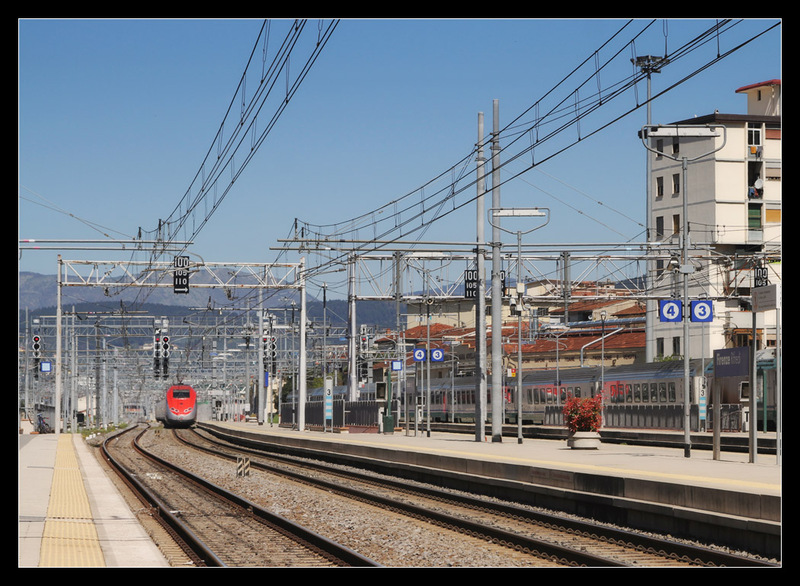 Stations in Italy featured bells for trains from each direction, shortly before a train was about to pass the bell stopped. Due to that and exact station announcements you always were well informed about what was happening next. 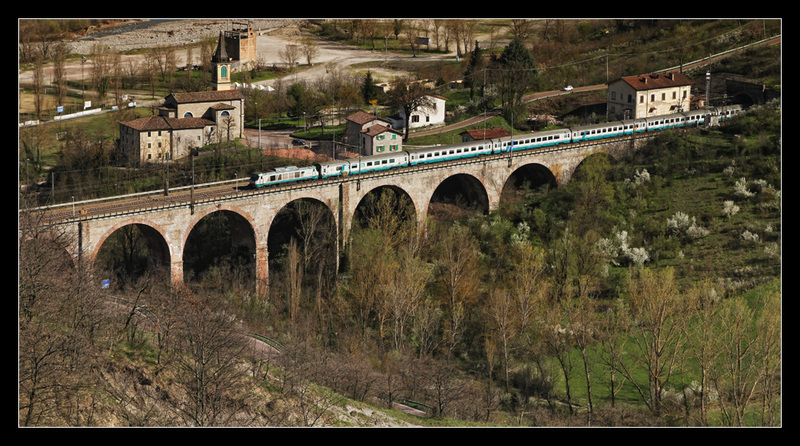 Class ETR 485 were also operating as "Frecciargento". 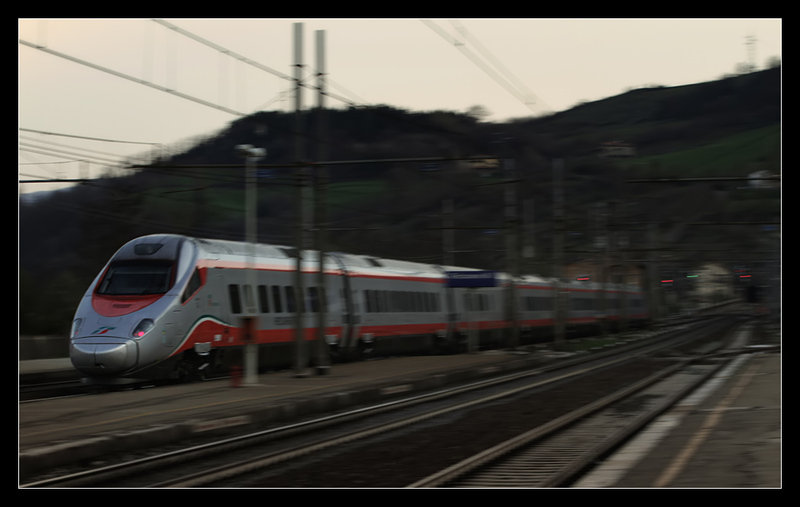 A southbound Italo passed quickly. And another class ETR 600. 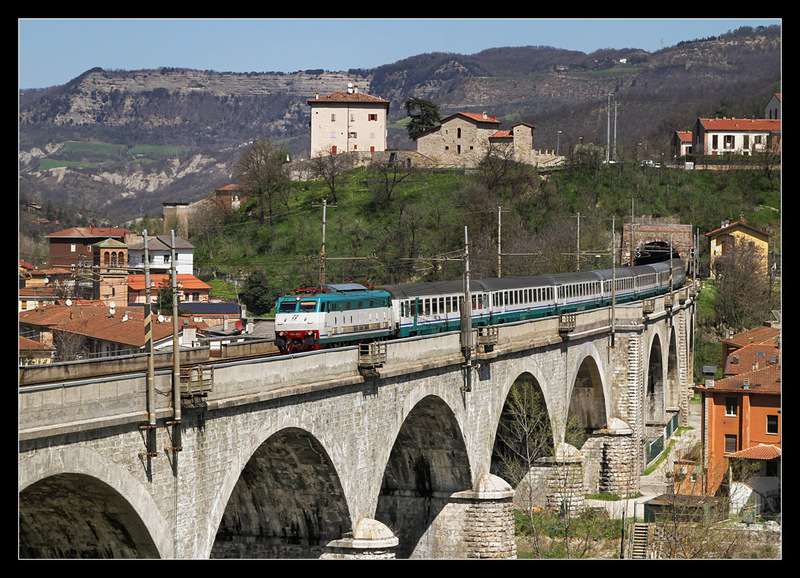 In the meantime InterCity 592 Rome - Trieste hauled by E402B 155 turned up. Finally well-known ALe 642 032 picked me up as R 6599 with 54 minutes delay... overall 9 highspeed trains had come by within an hour - nice unexpected bonus feature! During the long tunnel ride to Prato we made up a few minutes, but I was in no hurry to reach the next connection towards Florence. I procured supplies at one of the omnipresent food and drink dispensers. 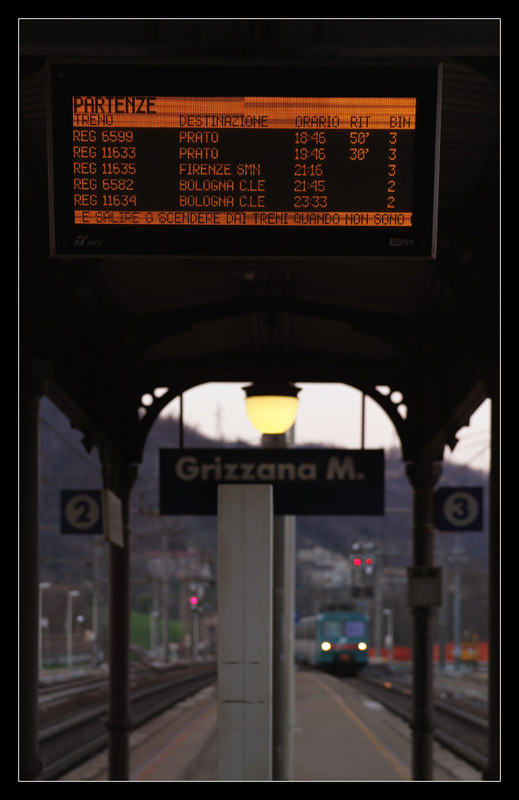 R 6628 to Pistoia entered platform 1. 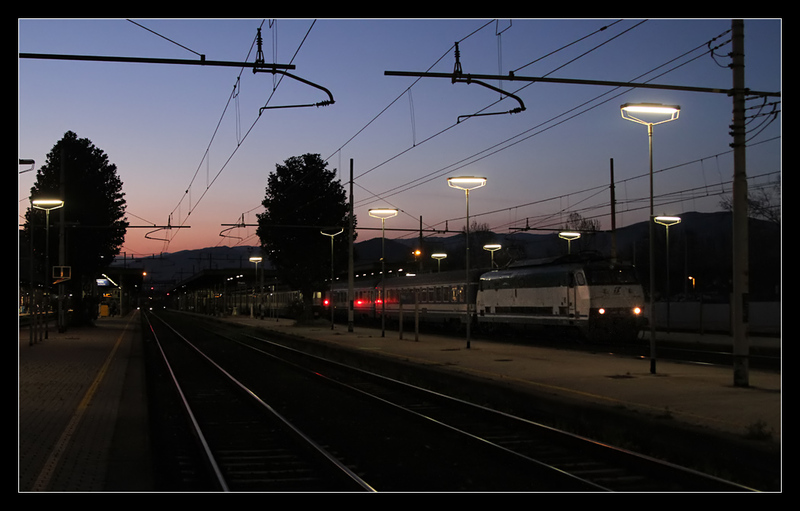 And a lovely bonus, that's why it paid off to be exactly there at exactly that time: night train InterCityNotte 795 Torino Porta Nuova - Reggio di Calabria Centrale with E444R 056-power departed Prato Centrale more than an hour delayed, in the background the rear lights of an IC to Milan. 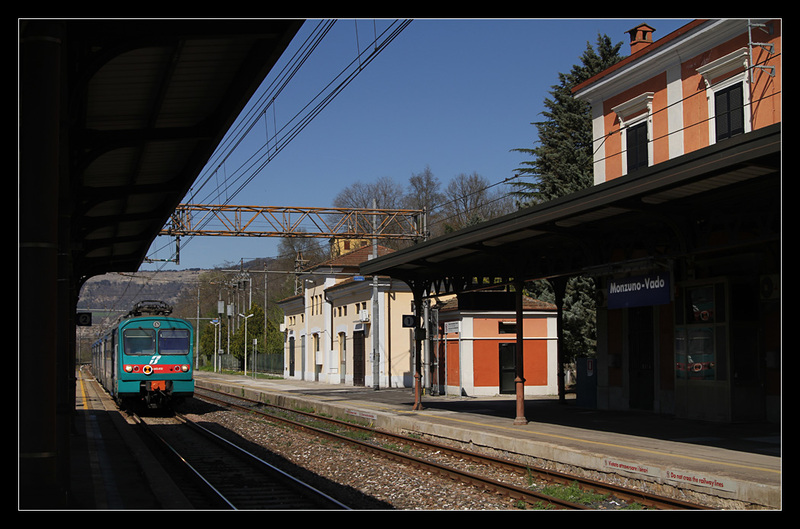 After this highlight I was satisfied and could walk back on the platform, a class ALe 426, the only double decker EMU I saw on the trip, took me to Florence. Inside the cab I noticed female personnel. 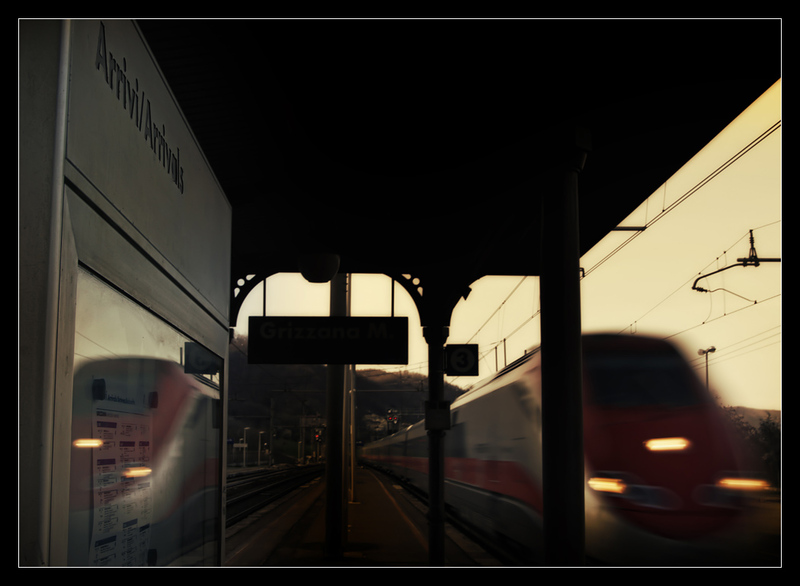 Due to some delay I reached a train with same departure time as my arrival at Firenze Rifredi. Sadly it turned out to be an already brimful class ALe 501 "Minuetto" EMU, but since I only had two stations to go I risked the adventure. In the door area we passengers held on to each other as well as possible. 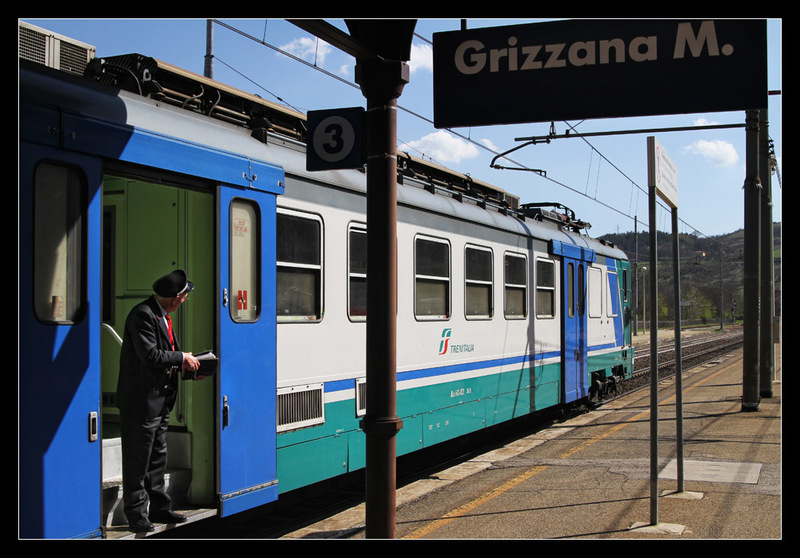 At Rifredi we stayed stationary for a while longer, the conductor dared to come by and was immediately bombarded with queries why such a tiny vehicle was in service to Pisa on a Sunday evening. Shortly later a guy with bicycle tried to enter and was met with an unanimous "Noooo!". But the EMU started to move shortly after and I arrived at the hotel soon - it had been a great day, more of that kind to follow!